Today is our LAST reveal day for our November Release and we're sharing two new adorable mini stamp sets! We have a giveaway too so make sure you read all the way to the bottom of this post to see how to win! Send a special delivery this holiday season with this adorable llama! This cute little 3 x 4 stamp set includes a llama laden with gifts for holidays and more. The "Fa-la-la-la-llama" and "special delivery" sentiments pair perfectly with the image. Use the included music notes and gift for making fun background patterns too! Deck the halls with these adorable projects from our Design Team! This peppermint kitty card by Juliana is so sweet! She used the kitty and mints from the Newton's Candy Cane Stamp Set and layered them over a tag cut out using the new Fancy Edges Tag Die. She also cut a green stitched rectangle using the Frames & Flags Die set (Those new dies were revealed on Monday's post here). Naki created this adorable Holiday llama card using the new Llama Delivery Stamp Set. The no line watercoloring on the image is so soft and pretty! Plus, It's so cute how she created a background by stamping all the little music notes! The new Frames and Flags Die set is great for making shaker card frames like the one on this card by Maria! 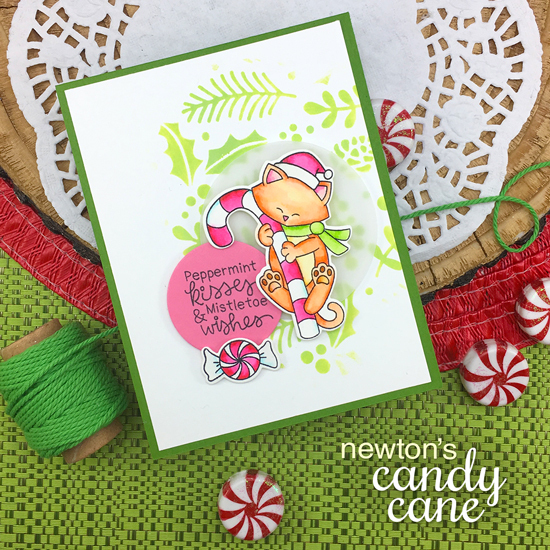 She added the kitty from the Newton's Candy Cane Stamp set on top and stamped the "Merry Christmas" sentiment from the Sentiments of the Season Stamp Set. She also added a cute bow and branches using the Pines & Holly Die Set. 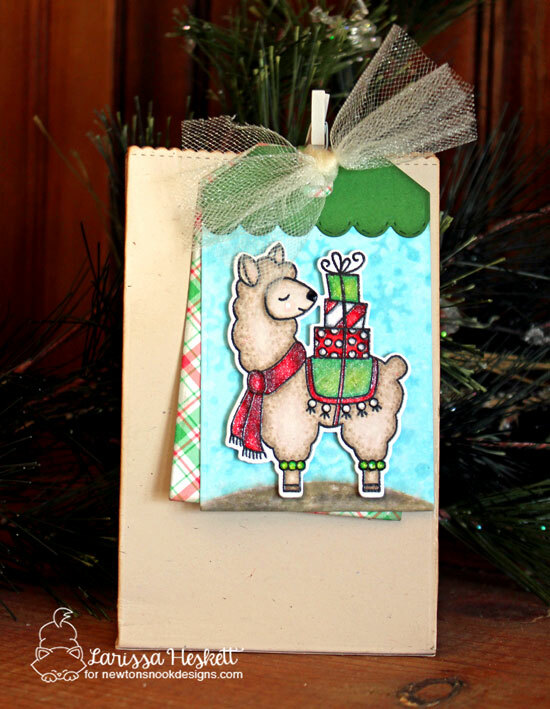 Larissa created a festive little holiday gift bag with a llama tag! She cut out the tag and cute little green tag topper using the new Frames & Flags Die Set (revealed on Monday's post here). The she added on that cute llama from the new Llama Delivery Stamp Set. Isn't her coloring beautiful!? 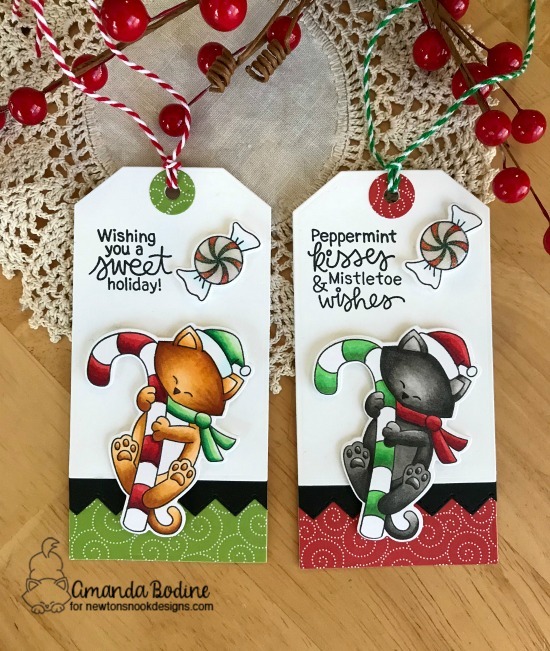 This duo of Holiday kitty tags were created by Amanda. She used our new Fancy Edges Tag Die Set (revealed on Monday's post here) to cut out the tags and added on those fun borders! Then she colored the kitty from the Newton's Candy Cane stamp set in two different color combos! 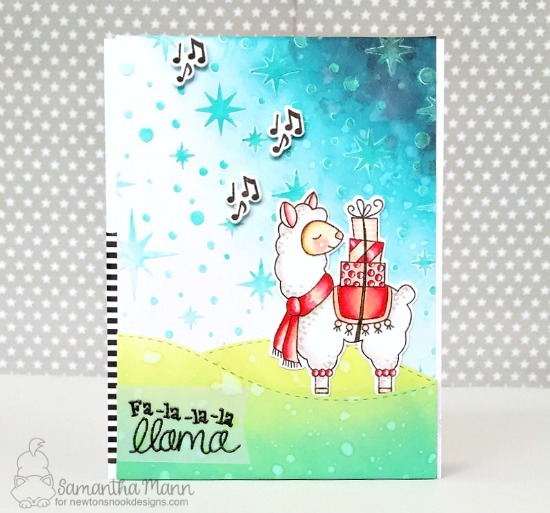 Samantha created this beautiful llama card using the new Llama Delivery Stamp set! She also used the Starfield Stencil to create that amazing sky and added in some hills with the Land Borders Die Set too! Isn't the gradation on the sky and hills just gorgeous!? Candy cane stripes are perfect for the Holidays! 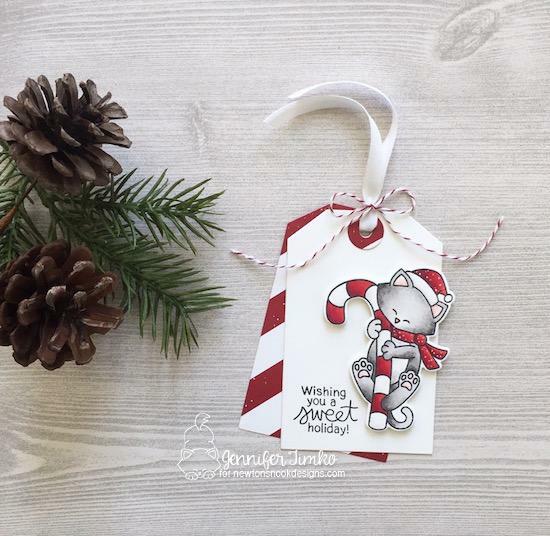 Jennifer created this adorable Holiday tag featuring that cute kitty from the Newton's Candy Cane Stamp Set. She also cut out those cute tags using the new Fancy Edges Tag Die Set (revealed on Monday's post here). The hues of pink and yellow on this card by Ellen are so pretty! She used our Llama Delivery Stamp Set and colored the llama with pretty bright pastels! She added some snowy hills using the Land Borders Die Set and added the sentiment over a tag die cut using the new Frames & Flags Die Set (revealed on Monday's post here). Tatiana created this festive Holiday card using the kitty from the Newtons Candy Cane Stamp set inside a pretty wreath! To create the wreath she used branched and berries that she die cut with our Pines & Holly Die Set! This cheerful holiday card was created by Holly using the the llama and gifts from the Llama Delivery Stamp Set! The color combo of pink, lime green and blue is so cute! She created snow drifts using the and Borders Die Set too! Would you like to win the “Llama Delivery” or the "Newton's Candy Cane"Stamp Set? EEP!!!!! Soooo cute! --> that llama! Jen, I love your cards! Wow! Wow! Wow! Two fabulous stamp sets!!! I want them!!! I'm melting down for the cuteness of these sweet cards and tags!!! Oh so cute! Love Newton's Candy Cane! Wow, love the new stamp and dies sets. Thanks for sharing. Both sets are super cute and as always the inspiration is amazing! The cards are fabulous! I adore the kitty stamp set. oh my word - these images are too adorable! loving all the inspiration from the design team!! I don't even like llamas but this one is too cute! Love the cat with the candy cane! Love the Newton Stamps and Newton cards. I love Newton! 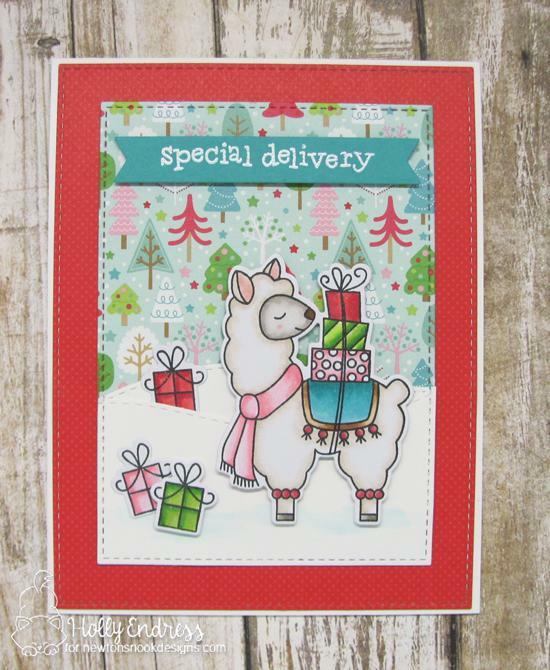 The Llama Delivery set is adorable, and the Newton Candy Cane stamp set is so fun.... both are bound to be favorites! Awesome creations with these sweet images! Ah, this little Newton, always ready to put a smile on every face ! These two smaller sets are so cute. I love the llama and how you Incorporated the candy cane in the second one! Love these previews.Can't wait to see what's on show at the other blogs. Love the ever so clever and creative ways with the new sets! Love them both. Probably would like Newton's candy cane first but it is a very close call. Love these blog hops. Loving the Llama and Newton! Both of these mini sets are sweet. Squeeeeeeeal! The cuteness is making me giddy! That llama is precious! Newton's Candy Cane is a must-have for sure! I'm off to do the blog hop now - I can't wait to see these cards up close! You have got it all with this release! Really looking forward to my Black Friday shopping! Amazing work you put into all these designs!!! Thank you! These are both just darling. Amazing release! Love the fa-la-la-llama sentiment - cute and clever! These has been my all-time favorite release! Can't wait to go shopping on Friday! Wow!!! Love both of these....That is one cute Xmas llama and Newton with the candy cane is adorable!! Congratulations on a wonderful new release!!! One of my favorites of Newton! A must have for sure! Every card is beautiful!